In Somalia, a country located in the so-called Horn of Africa, the climate is tropical, hot all year round, in addition, it is generally dry. Precipitation is generally scarce, typical of a desert or semi-desert climate in vast areas, while the wettest areas are occupied by savannah. The driest areas are the northern coast, where annual rainfall drops to around 50 millimeters (2 inches) per year, and the north-east, where it remains under 200 mm (8 in). On the other hand, the rainiest areas are the northwest, where lies the extreme offshoot of the Ethiopian Highlands, and precipitation reaches 500 mm (20 in) per year because of the altitude (see Hargeisa), and the south-west, where it even exceeds 500 mm (20 in) per year in the hilly interior (see Baidoa). Rainfall is due to the zenith passages of the sun and occurs in two periods, from March to late May (the Gu) and from October to early December (the Dayr). Typically, the wettest months are April-May and October-November, but there are some exceptions: on the northern coast, where it rains very little, in practice, even these months remain dry; in the southern part of the coast, crossed by the Equator (see Mogadishu), the first rainy season continues until July, while the second is generally very weak. However, the rains in Somalia are quite irregular from year to year, in addition, they usually occur in the form of short showers and thunderstorms, and given the aridity of the soil, which absorbs water with difficulty, when they are more intense than usual, they can give rise to flash floods. This usually happens in the south, in the valleys of the two main rivers, Juba and Shabelle, in the Gu rainy season, and until July (therefore, from March to July), but it can sometimes happen even in the north, when one of the albeit rare tropical cyclones reaches the area (see below). 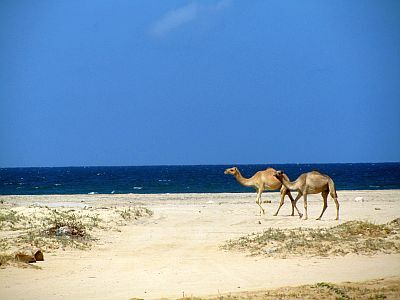 During summer, the northern part of Somalia is affected by the southwest monsoon, which is characterized by currents moving towards the Arabian Peninsula. However, since the winds blow from dry inland areas, they do not produce special effects in Somalia, except for the passage of some cloud banks over the area. 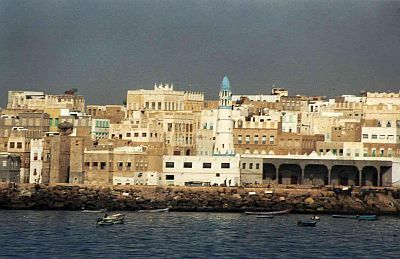 On the north coast, overlooking the Gulf of Aden, the climate is desert, characterized by hot and muggy winters and very hot summers, when the temperature can reach 45 °C (113 °F). The wind from the desert, especially in summer, can raise dust clouds. The rains are very rare and sporadic, and amount to approximately 50 mm (2 in) per year. Here are the average temperatures of Bosaso (formerly Bender Cassim). On the northern coast, the sun shines all year round; however, in summer, some cloud banks can reach the area, as part of the aforementioned monsoon. Here are the average sunshine hours per day in Berbera, in the western part of the coast. In the northern mountainous areas, the climate is milder because of the altitude. In Hargeisa, located in the northwest, 1,300 meters (4,250 feet) above sea level, at night, it can get cold in winter; the minimum temperatures may drop below 5 °C (41 °F) from November to March. Daytime temperatures are pleasant in winter, while they are acceptable in the summer months, since they hover around 30 °C (86 °F). The mountainous region of the north-west is one of the rainiest areas in the country, and the rains are not so scarce, since they amount to 415 mm (16.5 in) per year. In fact, here, there is only one rainy season, from mid-March to mid-October, when, however, rainfall is not too frequent and usually not abundant. Here is the average rainfall. In the north, there is another mountain range, parallel to the coast, the Karkaar Mountains, whose highest peak is Shimbiris, 2,450 meters (8,038 feet) high. These mountains are quite green, especially on the northern side, and above 1,200 meters (3,900 feet), there are forests, while the coast to the north, as previously mentioned, is desert, and the plateau to the south is semi-desert. On the east coast overlooking the Indian Ocean, temperatures are more stable throughout the year compared with the northern coast; in spring, the temperature slightly rises, and the hottest month is usually April in the south and May in the north, while in summer, the temperature decreases because of the prevalence of air masses coming from the ocean. However, the northern part is a bit hotter than the southern one. The rainfall on the east coast increases as you head south, and while the north is definitely desert, with precipitation lower than 100 millimeters (4 inches) per year, in the center it increases to about 200 mm (8 in), and in the south it exceeds 400 mm (16 in). In the capital, Mogadishu, which is located in the southern part of the east coast, just north of the Equator, temperatures are high and stable throughout the year. However, there is an increase between March and May and a decrease between July and September, which is, albeit slightly, the least hot period. This is due to the south-east trade winds, which, in this southern part of the country, blow in summer. Typically, the humidity is high, although sea breezes temper the heat. Sometimes, however, there can be torrid (that is, hot and dry) days, when the wind blows from the interior, and this can happen all year round. Rainfall in Mogadishu amounts to 430 mm (17 in) per year; the first rainy period is shifted forward by a month and can last an extra month, and therefore it goes from April to July, then the rains drop and remain infrequent until November, without there being a new clear increase in October-November, as is the case in other parts of the country. However, the rainfall records are quite high from March to November, which means that during some years, there may be periods much rainier than usual. The sun shines frequently throughout the year, but especially in winter. The least sunny months are June and July, ie the months when the rains are more frequent. In the southwestern inland areas, winter is scorchingly hot, and in February and March, the temperature rises further, before the rains. For example, in cities like Bardera and Garbahare, the maximum temperature is normally around 37 °C (99 °F) in January and 39 °C (102 °F) in March, while in summer, it drops to 33 °C (91 °F). A similar trend is found in the city of Baidoa (or Baydhabo), which, however, is a bit milder because it is located at 500 meters (1,600 feet) above sea level. In Baidoa, precipitation amounts to 570 mm (22.5 in) per year; the two rainy seasons, April-May and October-November, are very pronounced, while in the rest of the year, it rains very little. The temperature of the sea in Somalia is high enough for swimming all year round. In the Gulf of Aden, more closed and more to the north, it is lower in winter and higher in summer, when it becomes very warm, reaching 30 °C (86 °F) for several months. Here are the average sea temperatures in Bosaso. On the east coast, the sea temperature becomes higher in winter as you head south, while from June to September, it slightly drops because of the aforementioned south-east trade winds. Here are the average sea temperatures in Mogadishu. Sometimes, the center-north of Somalia, but especially the north-east, in the Horn of Africa (in the region called Puntland), can be affected by tropical cyclones, as happened in November 2013, November 2015, and May 2018. Cyclones form from May to December, and are more frequent at the beginning of the period (May-June) and at the end (October-December). Although cyclones are rare (and this is confirmed by the fact that the average rainfall in northeastern Somalia is low), when they occur, they can bring intense winds and torrential rainfall. The south of the country, where Mogadishu is located, being at the Equator, is generally spared by cyclones, or is affected marginally. The best time to visit Somalia in its entirety is winter, from December to February, to avoid both the summer heat in the north and the rains of the transitional seasons. It is worth while to recall that in the mountainous northern area, nights can be cold, while in the inland southwestern areas, the climate in this period is hot. Moreover, in December, especially in the first half, tropical cyclones are still possible. On the north coast, all year round, bring light clothing made of natural fibers (cotton or linen). In winter, you can add a light sweatshirt for the evening; in summer, bring lightweight clothing, long and made of natural fibers, and desert turban. In the northern mountains, bring light clothes for the day, sunglasses, a sun hat, and desert boots or sandals; in winter, add a sweater and a jacket for the evening; in summer, add a sweatshirt and a light jacket for the evening. On the coast of the Indian Ocean, all year round, light clothing of natural fibers, a light sweatshirt for the evening, and a scarf for the breeze; sunglasses and a sun hat. In the central and southern part (see Mogadishu), you can bring a light raincoat or umbrella between March and November (especially between April and August).